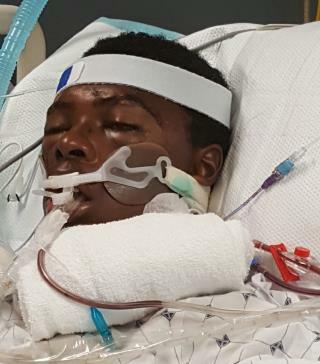 (Newser) – A 21-year-old Baltimore County man died in the hospital three days after being repeatedly punched by officers responding to his 911 call, the Guardian reports. According to the Baltimore Sun, Tawon Boyd called 911 early last Sunday. He told officers his girlfriend, Deona Styron, had "got him intoxicated and is secretly recording him." Boyd's grandmother, Linda Burch, says Boyd "was acting...like he was on something." Police noted he seemed "confused and paranoid," and it was clear he "needed to be taken to the hospital." But Boyd started trying to get into police cars and resisted attempts to restrain him, resulting in minor injuries to three officers. Based on the police report, it doesn't appear Boyd was trying to hurt the officers. It is obvious that this was a mental health emergency. What other job can one be paid to kill another human being in need of help, and be considered a hero. I'm sure there are at least two good cops somewhere, but they are probably on vacation. It is a sad day when the murderers are wearing the badges. It will be interesting to see what excuse they will use to exonerate them. Yes, Black Lives Matter. Well I think that when Cops Stand together there always together. No matter what they have to do. This idea of doing what they want to is getting people Killed. These Cops should be accounted for what they did to this Young Man. Enough is ENOUGH. No wonder the COPS don't get any Respect Because some of there other Bad Ones ruin it for the GOOD ONES. Maybe they should spend some time in PRISON for what they did. And see what it feels like to BEAT on for NO REASON. Just because somebody wanted to do that to them that day. CARMA that's what it's called. Just do what the Police say, if you do not obey them you may die.